Peach Serenity White and Green Tea is an infusion of Darjeeling and and a unique Chinese White Tea, also known as "white peony". 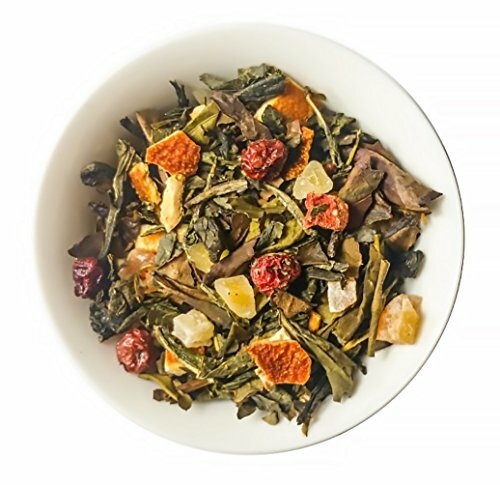 This tea is then mixed with citrus flavors to highlight its unique flavor. When brewed this drink is peachy with sour notes, and some have described it as having a cup of peaches. Origin: This blend is derived from the Chinese Pai Mu Tan White Tea or also known as Bai Mudan which literally means "white peony." This unique type of white tea is made by plucking each tea shoot with two immediate young leaves to give the drink fuller flavor and greater potency than other major types of white tea. GREAT TASTE - Amazing Peach Serenity White & Green Tea that when brewed is peachy with sour notes. AROMA - A bouquet of citrus flavors highlight our Peach Serenity. FRUIT FROM HAWAII - We are proud to source our fruit directly from Hawaii. CONTENTS - Contains 2oz of loose leaf tea that makes 15-20 cups. FOOD - GRADE BAG - Our bag is designed to keep tea fresh with its zip-lock seal and is 100% recyclable.